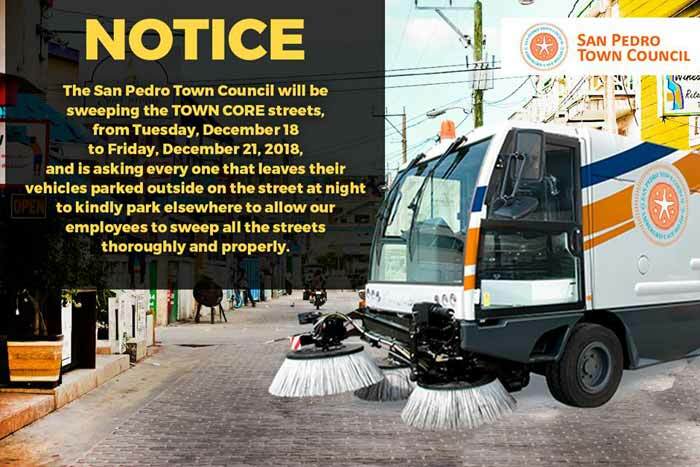 The San Pedro Town Council will be sweeping the TOWN CORE streets, from Tuesday, December 18 to Friday, December 21, 2018, from 12 Midnight to 6:00 p.m., and is asking every one that leaves their vehicles parked outside on the street at night to kindly park elsewhere to allow our employees to sweep all the streets thoroughly and properly. We ask for your cooperation and understanding in this matter. Thank you.